Mobile folding dining canteen tables on sale now! Nationwide delivery, product helpline, easy on line ordering and FREE ON SITE PRODUCT DEMONSTRATION AND SPACE EVALUATION. We sell a wide range of mobile folding tables that can be used in school and academy canteens, classrooms or school dining rooms. These easy to move and store folding canteen tables are a great buy for schools, academies and colleges wanting to make multiple use of limited room space. We supply a vast range of school dining tables, folding canteen tables, school dining room furniture, school mobile canteen tables and mobile folding school dining furniture. Covering the age groups from pre-school to University, the guess work with space planning can be removed with our free no commitment on site space evaluation. Our call out experts will measure up and take into account often over looked factors in space planning for a school canteen. 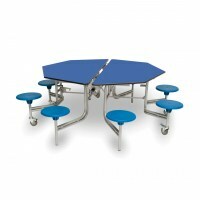 These tables will remove much of the time needed to put out and pack up tables for school spaces used for multi purposes. We are a specialist supplier of mobile school dining tables and benches and with a customisable range of tops and seats, these school dining room tables can be supplied to match your school colours. If you want to find out more or take advantage of our free space planning, call 01359 298072 today!